Founder, Famous Amos Cookies; "Father of the Gourmet Cookie Industry"
Today, Wally Amos is an icon and his name is a household word. In every job, Wally always started at the bottom and worked his way to the top. He worked at the William Morris Talent Agency where he represented Simon & Garfunkle and The Supremes. After years in the entertainment industry, he decided to begin selling what was then a weekend hobby—baking chocolate chip cookies. As they say, "the rest is history." He is the author of several books, including his autobiography, The Famous Amos Story: The Face That Launched a Thousand Chips. Wally has been National Spokesman for Literacy Volunteers of America and he is a Board Member of the National Center for Family Literacy and Communities in Schools. On the lecture circuit, he addresses audiences at corporations, industry associations and universities with his inspiring "do it" positive attitude. Today, Wally Amos is an icon and his name is a household word. Wally was born in Tallahassee, Florida, but went to live with his aunt in Manhattan when he was twelve. Wally dropped out of Food Trades Vocational High School when he was a senior to join the Air Force, where he earned his GED High School Equivalency Diploma. That certificate helped change his life. The GED Diploma made him eligible to train at a New York secretarial school after he was honorably discharged from the Air Force. In every job he held, Wally started at the bottom and worked his way to the top. Ultimately, he was hired by the William Morris Talent Agency, where he represented Simon & Garfunkle and The Supremes. After years in the entertainment industry, he decided to begin selling what was then a weekend hobby--baking chocolate chip cookies. As they say, "the rest is history." 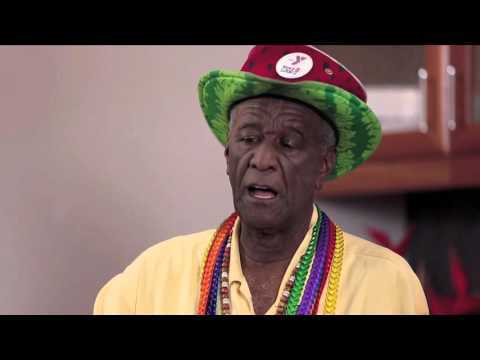 Now, Wally Amos is known by over 150 million Americans. His fame is grounded in quality, substance and a unique, positive mental attitude. 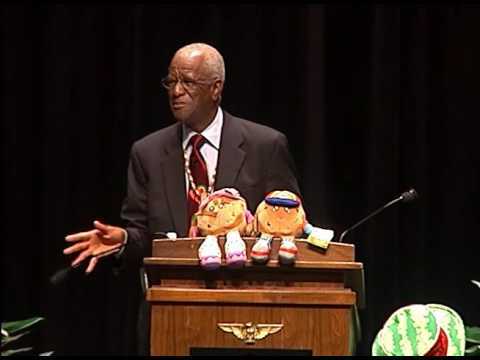 Wally Amos has been the recipient of many honors and awards. He gave the shirt off his back and his battered Panama hat to the Smithsonian Institution’s Business Americana Collection. Dr. Amos received an Honorary Doctorate in Education from Johnson & Wales University. He has been inducted into the Babson College Academy of Distinguished Entrepreneurs, and he received the Horatio Alger Award, The President’s Award for Entrepreneurial Excellence, and The National Literacy Honors Award. Wally is also an author. He wrote his autobiography, The Famous Amos Story: The Face That Launched a Thousand Chips, in 1983. He collaborated with his son, Gregory, on The Power in You: Ten Secret Ingredients to Inner Strength, a hopeful, inspirational book that shares Wally’s philosophy and life experiences. His book, Man With No Name: Turn Lemons Into Lemonade, published by Aslan press in 1994, tells how Wally lost everything, including his name, and turned adversity into opportunity. Wally’s book, Watermelon Magic: Seeds of Wisdom, Slices of Life, uses watermelon as a metaphor for life, sharing his personal path to wisdom, humor, joy and a positive outlook on life. His most recent book, The Cookie Never Crumbles, is indeed a cookbook, but instead of edibles, Wally offers recipes for life--specifically recipes for the successes you can whip up in your own life, if you have the right ingredients! Over the years, Amos has acted in a number of network sitcoms and appeared on hundreds of interview shows and news programs. He is a TV teacher/host of 50 episodes of state-of-the-art programs for adult basic learners that air on PBS stations nationally. He has acted as product spokesman for several prominent corporations, including Hush Puppies, United Airlines and the California Egg Board. Since 1979, Wally has been the National Spokesman for Literacy Volunteers of America, which is now called ProLiteracy Worldwide. He is also a Board Member of the National Center for Family Literacy and Communities in Schools. His latest enterprise is Uncle Wally's, which produces a premium line of gourmet muffins. On the lecture circuit, he addresses audiences at corporations, industry associations and universities with his inspiring "do it" positive attitude. Wally's Watermelon Credo has become the guide by which he lives his life. He will share how the alphabets of Watermelon help him remember that what he believes creates his belief system - the basis for everything that happens in his life. He will share how Attitude has become the map that helps him navigate through all his life experiences. He will use children's books to demonstrate how to be a better Team player. He will share personal examples why Enthusiasm really is the wellspring of life and how respecting others will help build your own self-esteem. He will tell why making commitments, saying, "I will," will get much better results than saying, I'll try." He will show how to make every day of your life a fun day. He will talk about why Love is the Answer and he will prove that the only way you can live life is One day at a time and that it truly is beneficial to absolutely Never, Never ever give up. After hearing Wally you will have no choice but to BE POSITIVE REGARDLESS. Wally Amos is a man of wisdom, a man of humor, and a man of joy. And he has learned the greatest secret in life: You can be happy no matter what. Wally will share his inspiring collection of "recipes," and tell you how adversarial situations are often blessings in disguise, and how the lessons we learn in life sometimes come from the most unexpected places. The Cookie Never Crumbles is Wally's philosophy and during his lecture he will tell you, through touching, hilarious, thought-provoking stories, how you can adopt this philosophy for you. From Wally's childhood, up through his days in the entertainment business, to the creation and loss of "Famous Amos" cookies, and to his current way of life, Wally Amos struggled, adapted, and finally triumphed. His inspirational advice will make you laugh, make you dream and make you think. This is a message built on faith! The Power in You is designed to demonstrate that life is an inside job. Using his personal experiences, Wally explores the power in words, faith, enthusiasm, giving, attitude, love and other positive aspects of life to help the audience connect with their inner power. Throughout the years that he has been speaking,The Power in Youhas proven to be an excellent vehicle for building self-esteem and confidence. What are the ingredients that have made Mr. Amos a success? Focus, Teamwork, Follow Through, Balance. This program is an enlightening experience where the audience will explore their own belief system and evaluate their own values. A super-charged speech for anyone or any company ready to turn his or her lives/career/corporation around. By the way, you have to book Wally to get the rest of the recipe. Hawaii's beloved "Cookie Man" focuses on helping people to shed the cultural stereotypes and myths that often cloud their decisions and misdirect their actions. Emphasis is placed on getting in touch with the truth of who we are now versus what we've been in the past. Participants will realize that each of us creates our own belief system and will learn how to transform the negative beliefs they may have into positive ones, while simultaneously unlocking their inner power.